Vast areas of unspoiled and virtually unexplored protected wilderness, make Zambia an undisputed favorite among dedicated safari enthusiasts. Taking its name from the mighty Zambezi River, which flows along its southern border, Zambia has set aside a large percentage of its land as wildlife reserves. This well-watered region of Africa has large tracts of open woodland and floodplains rich in wildlife. Small, well run lodges and camps offer friendly, personal service in pristine wilderness areas known both for their concentration and diversity of game and birdlife. Within Zambia’s borders are several national parks each with its own character and particular blend of predominant animals and birds. South Luangwa and Kafue National Parks are ideal wilderness areas. Here you can enjoy traditional walking safaris, mobile tented camps, remote bush camps, night drives, game fishing, and water borne activities. Zambia is well known for its top-quality bush guides. Zambia shares the mighty Victoria Falls with Zimbabwe, and is one of its most popular destinations. The warmth and welcome of the Zambian people is legendary. Location: Zambia is located in Southern Africa, east of Angola and north of Botswana and Zimbabwe. 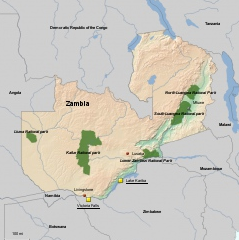 Size: Zambia covers an area covers 290,586 square miles of land, slightly larger than the state of Texas. Population: Just over 14.5 million people live in Zambia. Languages: You will most likely hear English (the official language) as well as Bemba, Kaonda, Lozi, Lunda, Luvale, Nyanja, and Tonga. In fact more than 70 languages are spoken in Zambia. The Flag: Green in the Zambian flag represents agriculture. Red recalls the struggle for independence. Black stands for the Zambian people. Orange symbolizes Zambia’s mineral wealth, particularly the major deposits of copper. The eagle flying above the colored stripes is intended to represent the people’s ability to rise above adversity. Currency: At most hotels and lodges, the US$ is widely accepted, but local currency is the Zambian Kwacha which is divided into 100 Ngwee. Kwacha means “new dawn” in Nyanja, one of the many local languages. Combine with Zambia with: Botswana, Malawi, Zimbabwe or South Africa. Located on the Zambian side of Victoria Falls, Livingstone is a small town of about 80,000 inhabitants. Visitors will, of course, want to see Victoria Falls and a good view of the Eastern Cataract and Boiling Pot can be seen from the Zambian side. White-water rafting trips on the Zambezi River, below Victoria Falls, are also offered from Livingstone, as well as sunset cruises on the Zambezi and canoe safaris on the upper portion of the river. The Livingstone Museum is the National Museum of Zambia and is renowned for its collection of Dr. Livingstone’s memoirs. Situated in a remote region, Zambia’s South Luangwa Valley is home to over 60 different animal species and over 400 different bird species. Experts have dubbed South Luangwa as one of the greatest wildlife sanctuaries in the world, and not without reason. The concentration of game around the Luangwa River and its ox bow lagoons is among the most intense in Africa. As one of Africa’s most unspoiled parks, South Luangwa National Park features a great diversity of habitat, scenery and wildlife. The Luangwa River and its lagoons form the park’s eastern boundary and play a major role in the ecology of the region. The changing seasons add to the Park’s richness ranging from dry, bare bushveld in the winter to a lush green wonderland in the summer months. The visitor can expect a wildlife experience that is difficult to duplicate elsewhere in the world. The valley has been called the “Last Kingdom of Elephants” and today it has a population estimated at 15,000, along with equal number of hippo in the Luangwa River. Luangwa allows night game viewing with spot lights to glimpse the fascinating nocturnal creatures not visible or active during the day. Lions on the hunt, hyenas, civets, honey badgers and porcupines are often seen at night. Most notable, however, are the leopards which are frequently observed stalking and hunting their prey, or interacting with marauding lions or hyenas intent on robbing their kills. Walking safaris, under the guide of experienced safari rangers, can last from a few hours to much longer, mobile camping safaris, where you explore this wilderness by walking from bush camp to bush camp. The Lower Zambezi National Park, the most recent of Zambia’s National Parks, was for many years a forgotten wilderness. But now the 2500 square miles of superb game country welcomes visitors from around the world. It lies along the northern bank of the Zambezi River, downstream from Victoria Falls. The sparkling waters of the Zambezi are a focal point for the abundant wildlife, which includes elephant, hippo, buffalo, zebra, lion, cheetah, leopard, various antelope species, baboon and vervet monkey, together with a great variety of birds. There is an escarpment along the northern end, which acts as a physical barrier to most of the park’s animal species. The river’s edge is overhung with a thick riverine fringe, mostly diasporus, ficus and other riverine species. Further inland is a floodplain surrounded by mopane forest and interspersed with winterthorn trees and Acacia albida. The hills, which form the backdrop to the park, are covered in broadleaf woodland. Canoe safaris have become a popular way of exploring the Lower Zambezi, enabling visitors to get close to the wildlife in its natural habitat, although a lookout needs to be kept for the large crocodiles which live in its waters. Fishing is also good along the river, and most lodges offer fishing with rods and simple tackle is provided. Healthy tiger fish and bream catches are common as well as vundu, a member of the catfish family, weighing up to 25 pounds. Lusaka is the fastest growing city in Central Africa. Its pleasant climate and central location make it an excellent stepping stone for discovering the whole of Zambia. The tourist passing through the capital may not see any reason to stay, but Lusaka is the product of a country battling to find its way in a new world, caught between colonial beginnings, years of socialist independence and new democracy. It typifies the problems many African countries face as they find their “independent” footing in a world that’s surging ahead. So it is worth spending some time exploring this lively city. A tour of Lusaka usually includes the bustling Luburma Market, the Anglican Cathedral of the Holy Cross, the Freedom Statue, the Munda Wanga botanical gardens and the adjoining zoo. Kafue is Zambia’s oldest park and by far the largest. It was proclaimed in 1950 and is spread over 13,400 square miles – the second largest national park in the world and about the size of Wales. Despite the depravations of poaching and lack of management, the park is still a raw and diverse slice of African wilderness with excellent game viewing, birdwatching and fishing opportunities. Much of the park consists of woodland, which opens out at intervals into wide, grassy areas known as “dambos”, grazed by sable, hartebeest, wildebeest, buffalo and zebra. From the astounding Busanga Plains in the northwestern section of the Park to the tree-choked wilderness and the lush dambos of the south, fed by the emerald green Lunga, Lufupa and Kafue Rivers, the park sustains huge herds of a great diversity of wildlife. Wildlife includes thousands of red lechwe on the plains, the ubiquitous puku, the stately sable and roan antelopes in the woodland and the diminutive oribi and duiker. Large prides of lion, solitary leopards and cheetahs are the prime predators. There is a host of smaller carnivores from the side-striped jackal, civet, genet and various mongoose. Birdwatching, especially on the rivers and the dambos, is superb. Notables include the wattled crane, purple crested loerie and Pel’s fishing owl. Over 400 species of birds have been recorded throughout the park. The Kafue and Lunga Rivers offer superb fishing opportunities, especially good bream, barbel and fresh water pike. Most lodges have fishing tackle, rods, boats and bait available.